Football is, as you know, a team game. And there is, of course, no 'i' in team. 11 vs 11, an enduring truth of the beautiful game is the teamwork inevitably trumps individualism and it takes more than just one player to win most games, cups and titles. However, sometimes all that logic completely goes out the window and one inspired player is the difference on the day, standing head and shoulders above the rest; a superhero among mere mortals. Quite probably the Premier League's all time top goalscorer's finest performance. Alan Shearer scored five as Newcastle thumped Sheffield Wednesday 8-0 in Bobby Robson's first home game in charge of the Magpies. Six defeats in their first seven matches meant Newcastle sat bottom of the Premier League before they bounced back in style against Wednesday. Shearer bagged a hat-trick inside 12 first-half minutes as Newcastle eased past their opponents. He became involved in Newcastle's build up as he assisted debutant Kieron Dyer's goal for Newcastle's fifth, before he added two more of his own to round off the display. Newcastle went on to avoid a relegation battle and finish comfortably in mid-table, while the performance stands out as one of Shearer's (and the Premier League's) best ever performances. Andrey Arshavin produced a masterclass performance for Arsenal as he scored four goals from midfield to dent Liverpool's title chase. The Russian playmaker's four goals that night constituted almost half of the goals Liverpool conceded at Anfield that entire season (9). Arshavin first converted a cross from Cesc Fabregas before scoring a stunning long-range second. His third fell after a Jamie Carragher mistake, before he swiftly finished off a superb Arsenal Counter attack with his weaker left foot. While some will argue he actually did little else on the night, his economical display was a masterclass in timing, finishing and instinct. Thierry Henry is unquestionably one of the Premier League's greatest ever players. He was a focal part of one of the greatest teams in English football. However, his hat-trick against Liverpool stands out as one of his most important performances in an Gunners shirt. The context of this game made his performance so much more impressive. Arsenal's 'Invincible' season was starting to look like it might slip. Arsene Wenger's side lost their chance at the treble in a week that saw them crash out of the FA Cup defeat and Champions League to Man Utd and Chelsea, while Liverpool now led them 2-1 in the Premier League with Arsenal's unbeaten campaign under serious threat. Step forward Henry. Having already scored in the first half, Henry was heavily involved in Robert Pires' equaliser before he added two more second half goals to complete his hat-trick. It always seems that goalkeepers never get the plaudits they truly deserve, but not here! 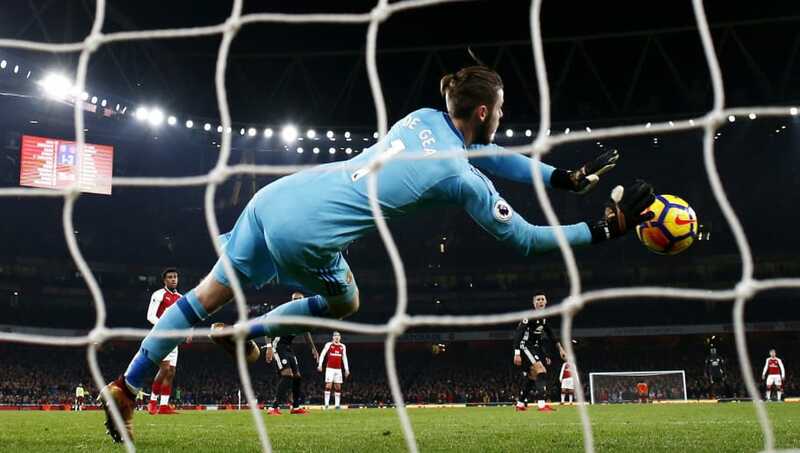 David De Gea produced the performance of a lifetime for Manchester United in a 3-1 win over Arsenal on the 2 December 2017. Arsenal managed 33 shots that night, with 16 on target as De Gea produced a Premier League record equalling 14 saves in one match. The Spaniard's reflexes were on display on multiple occasions as Alexandre Lacazette and Alexis Sanchez fired at the United goal from all angles. De Gea has been credited with saving crucial points for United, but the Arsenal game was arguably his finest hour in a career filled with top drawer performances. Without De Gea in goal that night, United would likely have left the Emirates with nothing. Berbatov is one of only five players who have scored five Premier League goals in a single game (Shearer, Andy Cole, Jermain Defoe and Sergio Aguero are the other four). However, it is the manner in which the Bulgarian scored his five which gets him on this list. Berbatov perhaps wasn't the hardest working figure on the pitch, but his elegance made it seem like he wasn't even getting out of second gear. His performance against Blackburn was the high point of his career and the purest display of his game at its very best. He played delicate passes, got involved in neat buildup with clever flicks and finished off team moves with supreme confidence and nonchalance. United won 7-1 in the end as Berbatov rounded off a superb performance with the best goals haul of his career in a truly incredible individual performance. 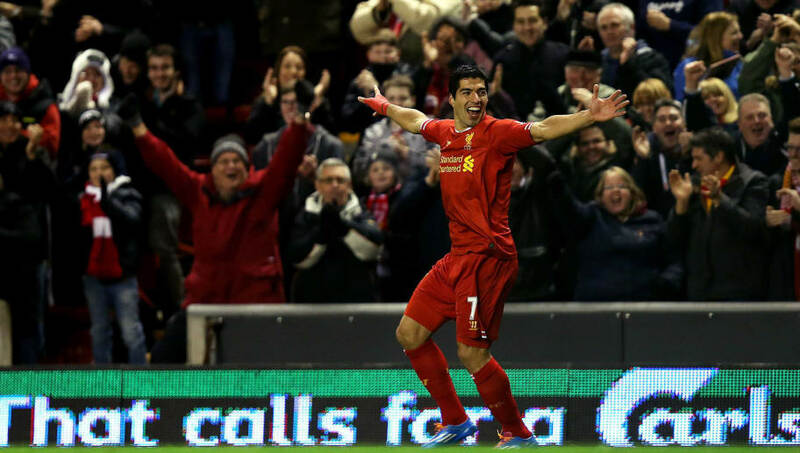 Luis Suarez absolutely loves playing against Norwich. 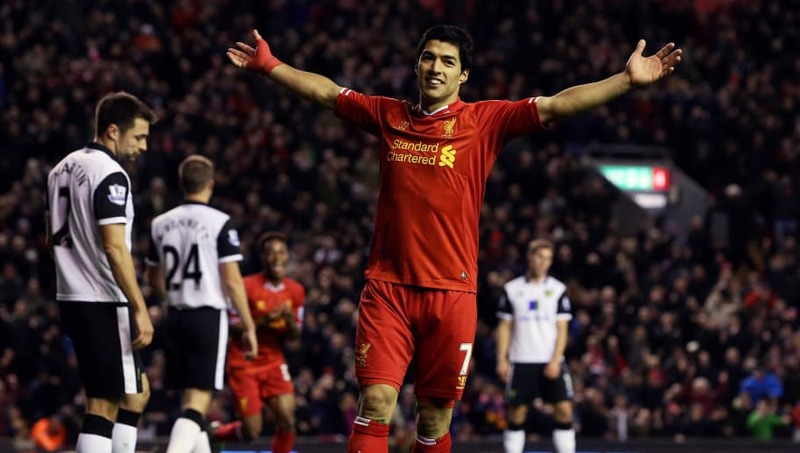 The Uruguayan has scored 12 goals in six games against the Canaries, including three hat-tricks, becoming the first Liverpool player to score three trebles against the same club. However, his performance on the 4 December 2013 is the one to remember. He scored four goals of the highest quality that night, as he single-handely dismantled Norwich. Suarez's first, a 40-yard lobbed volley, was followed by a neat corner flick, a 20-yard half-volley and a picture perfect free-kick. You are unlikely to see a player score four more beautiful goals in one match. The Uruguayan's performances that season earned him the Premier League Golden Boot and so nearly bought the Premier League title to Anfield.